This is his hair when it's neat. 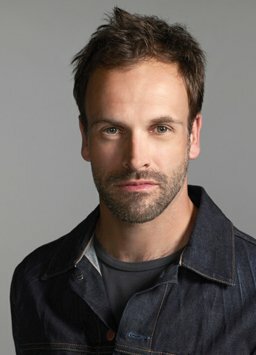 Jonny Lee Miller (born 15 November 1972), grandson of Bernard Lee (M from the older James Bond films), is an English actor. He is the son of Anne Lee, who worked in theatre, and Alan Miller, a stage actor and later a stage manager at The BBC. He grew up "behind the scenes" at the BBC, and made an uncredited appearance in Doctor Who in the 1982 story "Kinda". Complicity is also known as Retribution in some markets. Doctor Who: One episode, uncredited. Mansfield Park (1983): Charles Price. Keeping Up Appearances: one episode as "Toy Boy". Dead Romantic: Paul, in the made-for-TV film. Goodbye Cruel World (miniseries): as Mark. EastEnders: two episodes as Jonathan Hewitt. Cadfael: one episode as Edwin Gurney. The Canterbury Tales: Arty, in The Pardoner's Tale episode of the BBC's modernised adaptations. Eli Stone: as Eli Stone. Dexter: one season as Jordan Chase. Elementary: As Sherlock Holmes, in the US "contemporary update". Danny Boyle's Frankenstein where he alternated the roles of the doctor and the monster with Benedict Cumberbatch. They jointly won an Olivier Award for Best Actor and the Evening Standard Theatre Award for Best Actor for this production. Byronic Hero: Literally, in one case. Other roles may fall into this trope as well. Dyeing for Your Art: Trainspotting. He's also not above shaving his head for a role; notably in Frankenstein — he shaved his head completely to better accommodate the "monster" makeup and wore a wig as Frankenstein. For Someone Who'll Watch Over Me he let his hair and beard grow out so he'd look more like someone who'd been held captive for months. Fake American: Dead Mans Walk, Melinda and Melinda, Eli Stone, Dexter, Mindhunters (southern accent) and Dark Shadows. Scottish English: In Trainspotting, Complicity, and The Flying Scotsman. Mistaken Nationality: Scottish, as a result of his accents. The Late Late Show talk show host Craig Ferguson declared him an Honourary Scotsman. Romance on the Set: Met (ex-wife) Angelina Jolie on the set of Hackers. Dated Jennifer Esposito, who was in Dracula 2000 with him. Typecast: By being cast in vampire films (examples include Dracula 2000, Dark Shadows and Byzantium).